Klamath Bird Observatory research scientist Dr. Sarah Rockwell was mentioned in the most recent issue of Living Bird, published by the Cornell Lab of Ornithology (click here to see the article). Sarah completed her Ph.D. research with Dr. Peter Marra (now Director of the Smithsonian Migratory Bird Center) on the endangered Kirtland’s Warbler in her home state of Michigan. 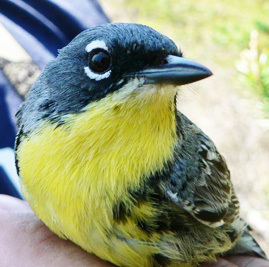 She found that after drier winters in The Bahamas (which are predicted by several climate change models), Kirtland’s Warblers arrived on Michigan breeding grounds later in the spring, raised fewer offspring, and had lower survival rates that year. This emphasizes the importance of winter habitats for migratory birds; conditions there can carry over to affect birds during different parts of the annual cycle. 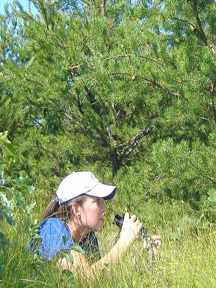 Sarah Rockwell searching for a Kirtland’s Warbler nest. Dr. Rockwell, who says she’ll always have a soft spot for this charismatic species, will present her research as an invited speaker in the Kirtland’s Warbler symposium that will take place as part of this year’s American Ornithological Society meeting. She will also present KBO research using birds as indicators to evaluate riparian restoration at beaver dam analogue sites in the Scott Valley, California (click here for more information about this project).